Hungry Howie's is known for it's flavored crusts and operates over 550 locations in 21 states. 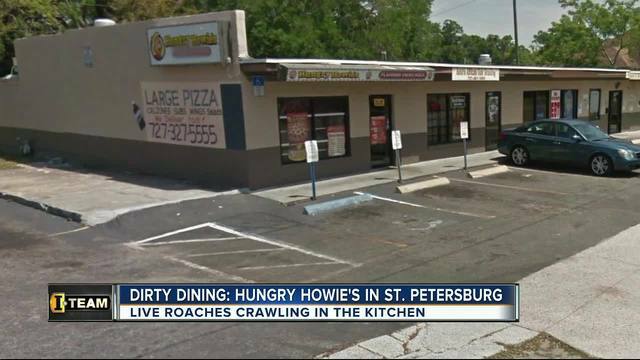 But a local Hungry Howie's location in St. Petersburg turned hungry customers away after inspectors discovered more than 100 live and dead roaches all over the kitchen. On Tuesday January 31, Hungry Howie's at 3073 18th Avenue South had to temporarily shut down for over 24 hours. In a special Dirty Dining report, ABC Action News anchor Wendy Ryan uncovered that inspectors found live and dead roaches on the front counter, inside an open box of take out bags, under the pizza table, behind the soda cooler, by the soda rack and soda machine, near the freezer, by canned olives, in the dining room, in the ladies restroom, in the reach in cooler, behind the microwave, at the pizza prep station and on the mixer. Inspectors discovered other violations which included uncooked pizza racks on the pizza prep table soiled with sauce, a hole in the wall right over the dough table, build-up of food debris, dust or dirt on racks and ceiling tiles and vents soiled with accumulated food debris, grease, dust, or a mold-like substance. And this wasn't the first time the state warned Hungry Howie's about its cleanliness and roach problem. In March of 2016, inspectors found live roaches under the pizza conveyor oven on the cooks line and 20 more dead roaches nearby. The state also documented an employee touching ready-to-eat food with their bare hands and pizza sauce in the walk in cooler at 53 degrees when it should be at 41 degrees or below. The state issued a stop sale on that sauce due to the dangerous temperatures. Ryan spoke to Hungry Howie's Manager, Mr. Freddy but he had no comment. Ryan also reached out to Hungry Howie's corporate office and left a message for Jeff Rinke, the Vice President of Marketing, but he never returned her calls.